The rays give the sacred image an aura of light. They appear as though they are emitted from her, based on the direction of the arrows and the wavy pattern – indicating that she’s giving birth to the sun. Since the Aztecs worshipped the sun as the god that gives them life, the image portrays the Virgin Mary as giving birth to god. This is further reinforced by the four-petalled flower on Our Lady’s womb as described below. The Aztecs called their sun god Huitzilopochtli (their god of war, too) and to appease him, they offered palpitating human hearts which they considered to be a symbol of life. They also believed in Ometéotl, a god with two natures. The Aztecs closely observed the movement of the sun, moon, and stars, and based their religious beliefs and way of life on these. They were deep into cosmogony – that branch of science dealing with the origin of the universe, particularly the solar system. The four-petalled flower is the only flower of its kind found on Our Lady’s robe. It is considered to be one of the highest symbols of the Aztecs as it depicts the four movements of the sun (the four seasons) as well as the North, South, East and West united in the centre by a fifth element giving it balance and equilibrium. The four petals also signify the four past eras with its centre signifying the birth of the Fifth Sun which coincided with the Winter Solstice of 1531 – Our Lady’s miracle of 12 December. The location of the four-petalled flower is known to the Aztecs as Nahui Ollin representing the motherhood of Our Lady. With its strategic location, Our Lady’s Image tells the Aztecs she is the Mother of the ‘sun god’ that is in her womb – the author and giver of life. 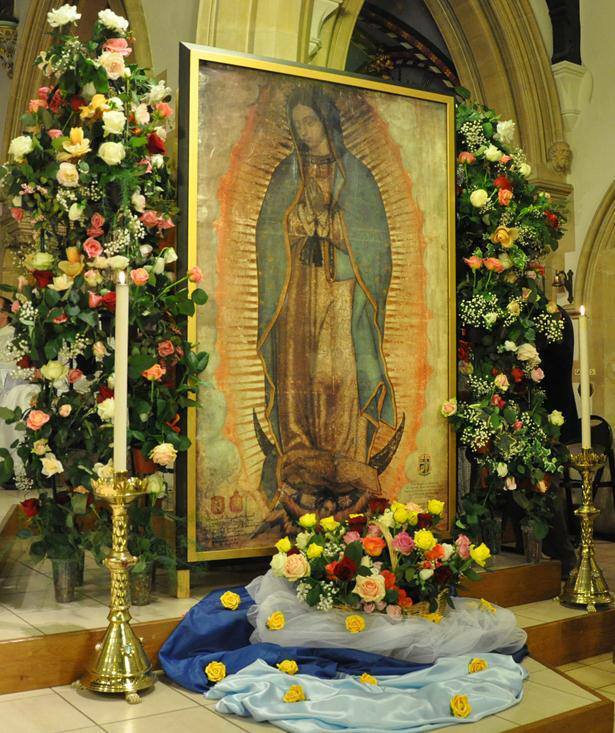 Our Blessed Mother’s face is bowed down, looking at everyone tenderly and with compassion. She is gazing slightly to one side as a sign of reverence and respect as native Indians considered it improper to look directly at anyone’s face. The face of Our Lady is that of a young girl who is considered mestizo, meaning a blend of races – in this case, Aztec and Spanish. This was the term used by the Spaniards to identify the children of Spanish conquistadores and Aztec women. The portrayal of the Blessed Virgin Mary on her Image as mestizo symbolized the birth of a new race. Looking closely into Our Lady’s eyes, ophthalmologists have tested this sacred image and affirmed that there are human forms reflected in her eyes, which measure between 8-9mm. It would be impossible to paint this detail within such a tiny space and on such rough material. Further examination by a Dr Jose Aste Tonsman revealed 13 persons reflected in her eyes. 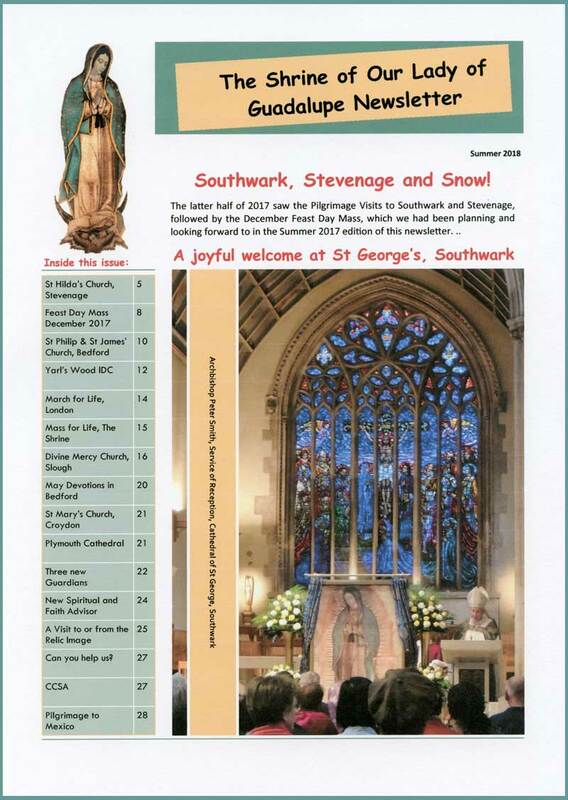 Magnified photos show the larger images as reflections of Juan Diego and Bishop Juan de Zumarraga. 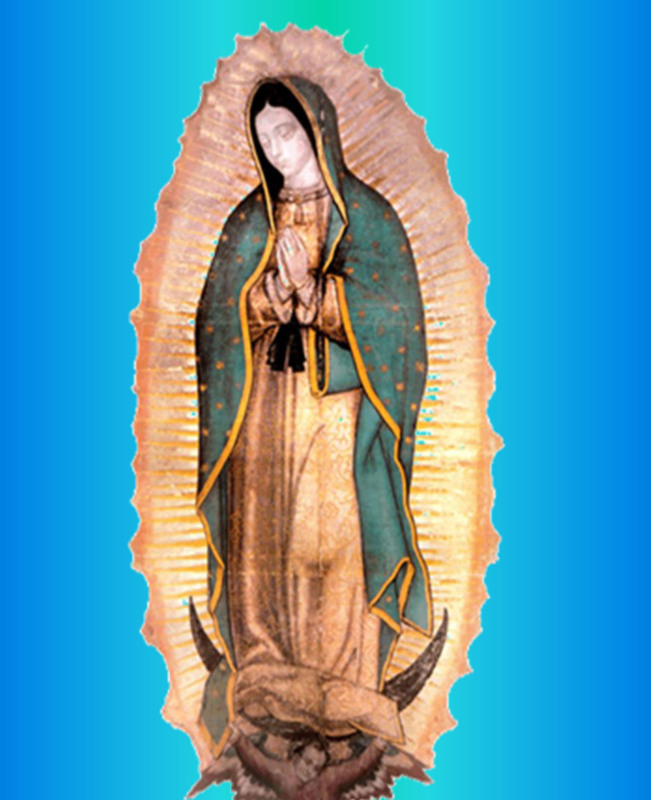 The rest could be images of those present when Juan Diego opened his tilma to show the Bishop the sign he had asked for. Check out the Scientific Page for more details on the eyes and their reflections. On the Sacred Image, our Blessed Mother’s hair is loose, indicating she’s a virgin maiden – married indigenous women braided their hair. Her hands are joined together in prayer, just as Europeans do, confirming her request that the Bishop build a chapel (a house of prayer) on Tepeyac Hill where she appeared. The Blessed Virgin’s hands show her right hand as being more delicate and lighter in colour than the left which is fuller and darker – depicting her message for unity of the Indian and Spanish cultures and the birth of a new race. Her beautiful turquoise mantle covers her whole body from her head down to her feet and is edged in gold. The indigenous people considered her an Empress since only their Emperor wore this colour. Her mantle is covered with 46 eight-pointed stars which are believed to be the stars that were in the heavens during the winter solstice of 1531.